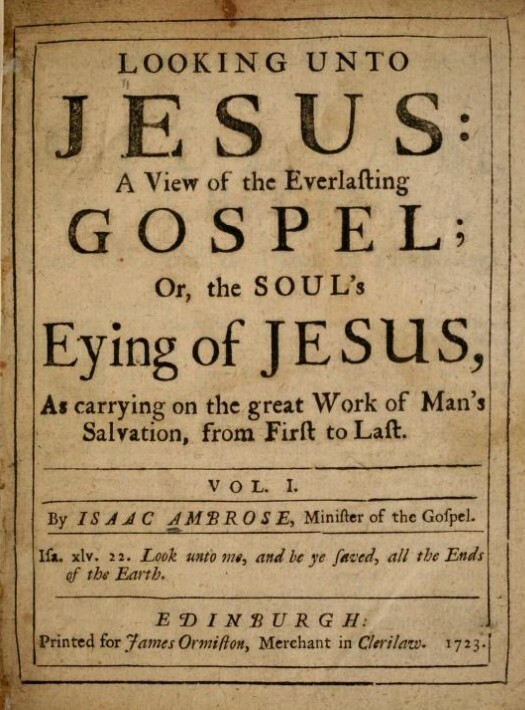 This Easter season, my reading on the resurrection has included the relevant section from Isaac Ambrose (1604-1664)’s book Looking Unto Jesus. The resurrection portion of the 700-page book is about 80 pages long, and Ambrose takes his sweet time examining how Christ was “carrying on the great work of man’s salvation” in his rising from the dead. The backbone of Ambrose’s book is the gospels, since he’s tracking the events of the life of Jesus. But his exposition draws on he depths of Old Testament theology on the one hand and the penetrating insight of the New Testament epistles on the other hand. And it’s also informed by classic Christian doctrine to a remarkable degree, not just in a broadly orthodox kind of way, but in considerable detail. Here are two examples, on two successive pages of the book (in section III, “of the manner of Christ’s resurrection”). What Ambrose is invoking here is not just the christology of the council of Chalcedon (451) but later elaborations of it from the next council (Constantinople II, 553) and from Leontius of Byzantium’s formula about the human nature of Jesus being enhypostatic: not personal in itself, but only personal as the human nature of the second person of the Trinity. Ambrose rightly sees that the soteriological and devotional (!) point he wants to make is supported by the conceptually elaborate post-Chalcedonian conciliar christology. But against this it may be objected, ‘The God of our fathers raised up Jesus, Acts 5:30, Acts 2:24. In many places, the resurrection of Christ is ascribed to his Father; how then is he said to raise up himself by his own power? Again Ambrose reaches into the toolkit, and finds just the tool for the job: the inseparable operations of the Trinity ad extra: “Christ’s resurrection is the indivisible work of the blessed Trinity; it is a work common to all the three persons, there is but one power of the Father, and of the Son; so that of both is truly verified, the Father raised him, and the Son raised himself.” Again we see Ambrose making a spiritual and devotional point: The Son is Lord of his own resurrection. And again we see him supporting the point by taking immediate recourse to a pretty austere doctrine of God. And it works: the Lordship of Christ simply must be grounded in the Lordship of the one God, rather than worried over as if contrastively ro competitively. What struck me in both of these cases is that Isaac Ambrose does not huff and puff and roll up his sleeves to put these doctrines in place. He calmly and serenely picks them up to explain his devotional point, presupposing that his Christian readers will be receptive to them, or even familiar with them (“we have formerly observed”). He takes up these doctrines with the deftness of long practice, and applies them almost effortlessly to understanding how the resurrection of Jesus Christ can be an effective work for us, and a manifestation of Christ’s own lordship. These ancient doctrines were once part of the normal equipment for pastoring and spiritual writing in the Protestant tradition. A devotional writer made use of them in explaining and applying the story of Jesus. We should do whatever we can to get ourselves and our churches back into that position.